Creating Halloween looks doesn't always have to be the typical ghouls and ghosts! Have fun with holiday manicures bringing in the color themes and making it your own. 5) Seal the design with a fast drying top coat, and your done! 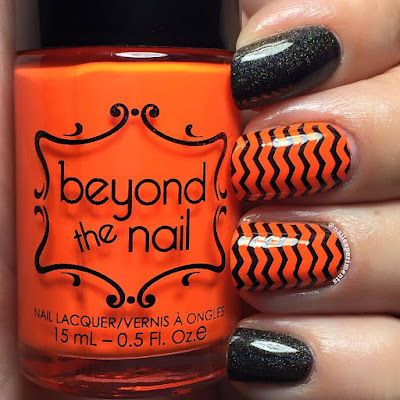 I have a deep love for Beyond The Nail polishes, as shes a fantastic Canadian Indie maker. Her polishes come at an affordable cost, paired with quality formula. Usually with neon polishes, it is preferred to apply a white base to get the color to pop. However, her neon collection is amazingly opaque and no white base is needed for the color to pop. "Creativity at your finger tips"
Thanks Maddy! I always have fun creating looks with your wonderful polishes!